Newly added feature by Facebook that has started becoming viral nowadays is for the Messenger app users. Now people who use Facebook Messenger app can share their photos in 4K resolution. People love to express their feelings via images and like to share it with their friends and relatives. 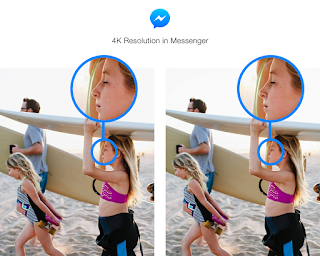 With more resolution value to your photos in Messenger app will give more picture clarity. Have a look at the image below which clearly shows the difference in clarity one will experience in the Messenger app. Now shared images are visible upto 4,096 pixels clear to you and for others too. For using this feature get the Messenger app updated from Google Play store or iOS store. If you haven't updated the app get it done soon and enjoy sharing with 4K resolution effect henceforth. Technology and Facebook Tricks blog.